Join me in my home on Saturday, November 21st from 1pm to 4pm for a 10-card Christmas Card Workshop. The cost of the workshop is $25. We will create 10 different cards, two each of 5 similar designs, but each card will be unique. You will have some supplies leftover to continue to create more cards and can purchase additional cardstock and accessories from me or use your own supplies at home along with the remaining printed papers and PML cards. Or, use them to create a beautiful Christmas layout! Afterall, they were meant to be a scrapbooking program! Over the last couple weeks, I've slowly revealed all 10 cards which are in the picture above. I've also been sharing additional cards I made with some of the extra PML cards leftover and will be also showing a layout (or two) in the coming weeks. The workshop fee of $25 covers half a pack of White Pines Paper, the White Pines PML Scrapbooking Program cards, card bases and envelopes and some flowers and bling for embellishing. For an extra $10 receive a full pack of paper and an additional 10 cards and envelopes. Add on Complements and/or an Assortment pack for $6 each. Most papers will be precut (except for the PML cards-we will cut them that day). It is possible to make this a Skype workshop, however, additional shipping charges will apply. Please sign up by November 10th to allow time to order supplies and put the kits together. Please contact me with any questions and sign up soon. There will be room for 5 at this workshop. These are the last two cards we'll make and after we're done you'll have plenty of PML cards and ideas to continue on with your cardmaking! See the next post for the details on the workshop. Two more with leftover cards from the workshop .... I added some complements to the owl card and I used Paper Sweeties sweet cuts to cut out the Joy on the bear/fox card. You will have all of these additional PML cards to take home and use for more Christmas cards. I did use some additional items to make them, but you can purchase extras or you can use what you already have at home to make more cards. This is a card I made with the White Pines paper, PML cards and complements (trees and sentiment). This is not part of the workshop, but something I made with the "leftovers" from the PML cards. The background was done with our new watercolors and watercolor paper and at the time I didn't have any green ribbon with me so I took some of my plain seam binding ribbon and painted it with the greens from my watercolor paints... then I sprayed it with gold color shine. Once it dried it was a little stiffer, I'm thinking because of the color shine, but that worked out ok because I was able to mold the ribbon exactly how I wanted it to lay. The penguins are from the Season's Greetings stamp set in the Holiday Seasonal Expressions Idea Book. These are Cards 7 & 8 for my November Christmas Card Workshop. All of these cards are made using White Pines papers and PML cards and a couple of CTMH's new Christmas stamp sets. If you don't know what a PML cards... think pocket scrapbooking... PML stands for Picture My Life. The cards are made with scrapbooking in mind... quick and still beautiful scrapbooking. We have pocket pages with of varying sizes and you can create some beautiful scrapbook pages with just a few cards and some of your photos or you can be more elaborate and add additional embellishments using our shimmer trim, Complements that match the paper packs, sequins, stamp sets... and don't forget a little journaling. These sets come with cards that are good for that too! Another great thing about Close to My Heart's PML cards is that they work so well with our papers and colors that you can have traditional pages mixed in with your PML pages! I had started scrapbooking like this... I take so many pics and I started making two or three pages as a traditional layout and then adding the rest of the pics behind in pocket pages. I still have the option to go back and create more traditional pages if I choose, but all the pics are there. No pressure. AND now with the PML cards... I won't need to go back... I can quickly decorate the pocket pages so they are beautiful too! And then there's the flexibility of using the cards on ... well... cards! That's what this workshop is about. You can get double duty from you PML cards you purchase. Don't need all of them for your pages? Use a few to create some quick cards to use or as gifts. Come back soon for the last two cards of the workshop and more details! Thanks for stopping by! I used to really celebrate Halloween... costume, painted face, decorations and all... but since the kids have grown I think I've become Halloween'd out... I still love it... but I just don't seem to have the energy to get all my stuff out and really have fun with the day. I do love the colors and the costumes and when I can be home I certainly love to hand out candy to all the cute little creatures and princesses. On our plane ride mom and I crocheted flowers for my projects to stay busy... this is one she made with some clearance Halloween colored crochet thread.. you should be seeing them pop up on some future projects AND a special project that is in the planning stages right now... more on that at a later date also.... I just LOVE these hats... somehow they made it all the way from the other side of the country without getting smooshed...lol! While visiting Ryan in Maryland we stopped at a Michael's and bought some more clearance items... just what we needed.. more stuff to take home in our suitcases...lol... but we stuffed it all in. The ribbon and sequins are Paper Sweeties and the black web overlay background is from Artbooking; button is Stampin Up and all the rest is Michael's clearance items... LOVE the gold web doilies I found!! I love using Emma from Paper Sweeties on my Christmas cards! She is just so cute! I had fun with her outfit and the sentiment are from the Have A Holly Jolly Holiday set and the bear is from the I Love You Set. Both of these sets have cute little outfits for the paper dolls along with cute accessories and sentiments... love them! I had a lot of fun mixing and matching colors and patterns for her Christmas Outfit. I stamped the top on a piece of White pines paper and colored in her bottoms. And of course.. she is barefoot. I used the Joy sweet cuts for the Believe cutout at the top. The background is painted with watercolors and then I splashed some reds and white over the top of it. The paper is White Pines... used that a lot last weekend! So I know I keep promising about more info for the November Christmas Card workshop and it is coming soon! In the meantime, here are two more cards we'll make from the White Pines paper pack and PML cards. The cards are really 5 designs, however the cards will all be different because they use different PML cards. I had a lot of fun using these PML cards to make Christmas cards over the weekend. They are such a great addition to the paper pack and really allow you to make a whole bunch of unique cards quickly. For this one the packages were on a 4x6 PML card (I did add a stamped one on the top) and then I used a strip I had leftover from another card to cover a date that I didn't want on there and used one of the great new Christmas stamp sets, Miracle of Christmas, for the sentiment. Used the same seniment stamp for this one and the zip strip from the paper pack to embellish this one along with one of the Art Philosophy poinsettias I love so much. Thanks for stopping and come back again all week... there is lots to see here! So... I spent the weekend creating and I knew I wanted to make one more card inspired by the Paper Sweeties October Inspiration Challenge. 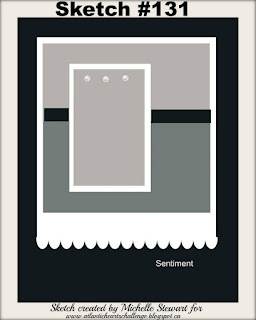 I very rarely use neutral tones solely in my cards and was surprised at how much "color" you can add. 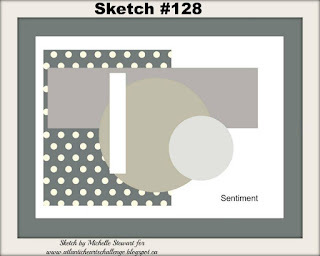 I used the CTMH White Pines paper pack and complements. The paper doll is Emma from Paper Sweeties. I also used one of my fave Paper Sweeties sets, Party Time to stamp the doily in the background. I used Outdoor Man Cricut cartridge for the trees and Art Philosophy to cut the poinsettias. Of course, I made the flowers using my favorite wet and crinkle technique before spraying them with gold color shine. Notice on Emma, I cut off her pigtails and left one to fall out of her hat.. a side pony tail... a tip I got from one of the awesome Design Team members over at Paper Sweeties. Thanks for stopping by and there are still a couple days left to participate in the Paper Sweeties Challenge! Just click here. Welcome to the last October Atlantic Hearts Sketch Challenge! So a few weeks ago, my friend Tracey created this gorgeous card for the Coffee Lovers Blog Hop with a gorgeous ruffled paper "skirt" on it (which you can see here) and it looked like fabric... I was shocked that it was paper. So, she was so kind to send us a link to an online tutorial (which you can see here). When I saw this week's sketch, right away I got excited because where the scallop is I saw ruffles! So I headed on over to the tutorial. I don't think my version is as fabric looking as Tracey's, but I'm pretty happy with how it turned out. I used the CTMH La Vie En Rose paper pack which I think is gorgeous with it's mostly black and white papers in various patterns and then bam! a rich and beautiful floral. I used one of Paper Sweeties stamp sets, Life is a Special Occasion for the carriage... for some reason whenever I stamp this one I emboss it with gold...lol... and made it into a "shaker"... not too much here moves because the sentiment "Don't Let Anyone Dull Your Sparkle" from the same set is inside and there isn't much room (I even glued a couple in there so they wouldn't move), but I think it looks pretty. Some more (roll your eyes here) paper flowers from Art Philosophy, ribbon from Paper Sweeties, the sentiment banners are from CTMH You're the Bomb, a gold button I got from Stampin Up, feathers from Petalo and of course.. the sequins are from Paper Sweeties... too much? Well, maybe, but I like it... More is more! Thanks for stopping by and hop on over to Atlantic Hearts and check it out! Welcome to another Atlantic Hearts Sketch Challenge AND Cards 3 and 4 for the PML Christmas Card Workshop in November! Two more quick and easy cards (in part thanks to Michelle's great layout)! White Pines is such a great Christmas paper pack. There certainly are some papers that you could use for non-Christmas cards and maybe I'll get to that later (or maybe next week!) but it is oh so beautiful for Christmas for sure. And now I've got two more done! And on this one I used the red glitter trim to cover up a sign the (adorable) raccoon was holding with another date on it.. so easy! Now, get on over to the Atlantic Hearts website to see all the great artwork from last week's challenge players and design team and get going and make something! 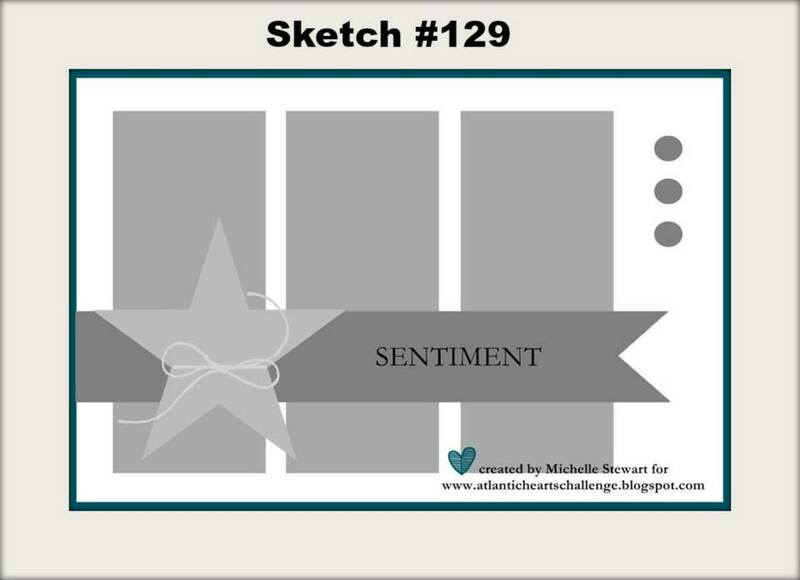 Welcome to another wonderful sketch by Michelle at Atlantic Hearts Sketch Challenge! My project this week is for a friend that needed a graduation card. I thought this sketch would be (and it was) perfect. It came together very easily and she is very happy with it. The papers are CTMH La Vie En Rose. These papers are so gorgeous all on their own. But they also work really well with many of CTMH's other products. The flowers and the star bursts are from Art Philosophy. The starbursts were cut from glitter paper which I also used to make the banner and frame the sentiment. I used the extra star cuts on the card as well. The sentiment card was cut from Artfully Sent. I used some more of my paper flowers... when I cut them now I cut a whole sheet in whatever color I'm using because then they're already cut. I set up a page full in Design Space and saved it. Added a few more extras and I was done! Don't forget to stop over at Atlantic Hearts to check out all of the great artwork and play along for this week! Thanks for stopping by! So... I wasn't supposed to be in my craft room this weekend... but... forgot I had a wedding card to make. The colors for the wedding are pink and orange. I used the Paper Sweeties Mason Jar set for this one... love it! Love the "fabric cover" that you can stamp on various patterns of paper... that's what makes it different from other jar stamps I've seen.... I think I'll be using this one often. The cover on this one was stamped on a gold linen texture paper. Also, I was wishing I had a pretty printed doily...then I realized I could make a doily that was the perfect colors and print by myself. Sometimes I think it's my first day...lol! I used the banner stamps and dies again also from Paper Sweeties as well as the flowers and Love sentiment. Thanks for stopping and don't forget to come back tomorrow for the next Atlantic Hearts sketch! I've done it! I've made my first Christmas Card of the season! I fought it and fought it, but when I saw this week's sketch it reminded me of an idea I had for a workshop. Details to come, but these are the first two cards for my 10-card Christmas Card Workshop in November. Although there will only be five designs, each card will be different. We're using the White Pines PML cards. These cards are made for quick and easy scrapbooking along with the pocket pages CTMH carries, however, they are a great way to make a quick and easy card as well! These cards do have quite a few with varying December dates, but we'll use them and alter them so that they make sense for the cards we're making. (Although, really handy for a Countdown to Christmas kind of them!) And after making the 10 cards, you'll have plenty left over for more cards or your scrapbook! This card originally said December 14th, but I made a cute little embossed "25" embellishment for both cards and conveniently covered up the date on the PML card... easy peasy! 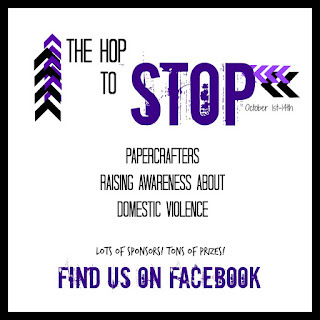 This is my submission for the Hop to Stop to bring awareness to Domestic Violence-a very worthy cause... check out the blog here for all of the details. I was so inspired by all of the beautiful backgrounds I saw during the Coffee Lovers Blog Hop that I sat down yesterday and created this background using watercolors, stamps, inks, gold color shine and embossing powder and some gold embossing paste that I just got from the Funkie Junkie. First I splashed the water colors on some water color paper all in purple shades. Then while it was still wet I splattered some of the same colors. After it dried, I sprayed some water all over it again along with some color shine. When that dried completely I took some of my old CTMH stamps, Natures Vein, and inked them up, sprayed water on them and stamped. Then when that was dry, I stamped the veins with Versamark and embossed with gold embossing powder. Then I put it under something heavy to flatten out the paper. Today, I took a stencil and some new gold embossing paste that I just got and added that in a couple areas. I'm pretty happy with the results. Easy... just lots of steps. Then I cut some leaves from Artistry and treated them the way I've been doing the flowers I've been making... the only difference being that instead of spraying them with water I slopped on some more purples of watercolors and waited for them to dry to damp before squishing them. Thanks for stopping and check out all of the wonderful purple works of heart over at the Hop to Stop and play along! There are lots of prizes to be won too! Welcome to the October 2015 installment of the Three Amigos Blog Hop! We are three CTMH consultants and friends who decided to challenge each other every month to create something. Each month we choose a different theme and for October the theme is interactive! We're not going to just give you cards that you can just sit around and look at... you're gonna have to DO something!! When I started out I was going to try to do a magic card (see my mom's blog if you don't know what that is). But it just wasn't working out the way I wanted it to... I didn't have the right stamps to do what I wanted to do so I changed what I was doing. I cut a pocket card pocket from Artfully Sent to start. I added some acetate to the front to make it easier to fill up the front and overlap my pocket window. I used Nevermore papers to cover the base. The pumpkins, haunted house, bats are all cuts from CTMH cartridges, but right now I'm not sure which came from which. I may update this later but to be honest.. I probably won't. And that cute little kitty is from the new Operation Smile stamp set, Animal Greetings. The witches hat is from another cartridge... possibly Happy Hauntings, but not sure. I scattered Paper Sweeties sequins everywhere because, well, that's how I roll. The "Happy Halloween" sentiment is from the stamp set that comes with Artistry and "Have a Sweet Day" is from Paper Sweeties. Last but not least, the tag. I created the night sky by using a circle I'd cut for something and held it on the paper while I sponged colors onto the paper around it. I started with purples closest to my moon and then got darker as I worked outward. I made the clouds with some gelatos. IDK.. 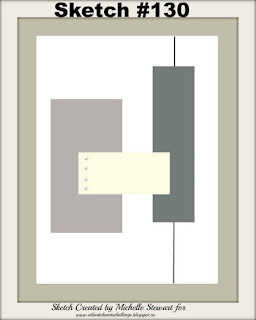 I like to look at it. This was around the time I was complaining that I didn't have enough Halloween stuff and later that evening I found out I won a huge stash of stuff from Choux Choux Paper Art Halloween Party which I did get in the mail today and am hopefully going to get to use today. I'm entering this card in Lori from Choux Choux Paper Arts first challenge ever as well... which ends tomorrow! There is still time to play along with this one and there is a $25 gift card to win! So get over there and check it out and play along... if you dare... MUAH HA HA HA (that's an evil laugh in case you couldn't tell... you know... for Halloween! Thanks for stopping by! Don't forget to hop on over to Donna's and Susan's blogs and see what awesome creations they have for you to look at! Pajamas All Day! It's All I want!